The way that Earth precesses (large white cones) and nutates (red wavy line) in space gives clues to processes in its interior. At a recent workshop, scientists discussed the fluid, gravitational, and magnetic factors that cause these motions. The white circle indicates the ecliptic (the Sun’s apparent path across Earth’s surface), and the gold circle indicates Earth’s equator. Adapted from Dehant and Mathews (2015), Precession, Nutation, and Wobble of the Earth, 551 pp., Cambridge University Press, New York. The gravitational pull of the Sun and Moon on the Earth, as well as many other smaller geophysical effects (including motions of Earth’s fluid core), cause Earth to wobble. Earth is not a perfect sphere but an ellipsoid flattened at its poles, so the forces acting upon Earth alter both its speed of rotation and the orientation of the axis on which it spins. The term “precession” describes the long-term trend of this latter motion, which is roughly circular and analogous to the motion of a spinning top. “Nutation” is the name given to shorter-term periodic variations: wobbles along this circular track. Last September, scientists gathered for a workshop in Brussels, Belgium, to discuss the role of Earth’s core in its nutation and to gain further insight into Earth’s interior processes. This was the first such workshop to be held within the framework of the newly established RotaNut project in the frame of an ERC (European Research Council) Advanced Grant. 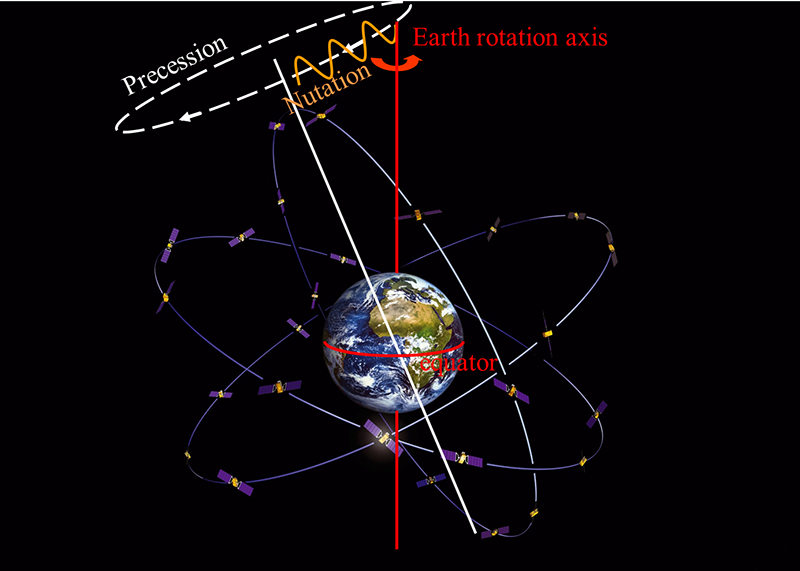 Precession causes the rotation axis of Earth to move in space at about 1.5 kilometers each year. Nutation introduces periodic variations on the order of 600 meters back and forth around the precession circle (from a vantage point looking down on the planet’s pole). Present observations allow these motions to be measured at the centimeter level. Speakers noted how such observations show that there are significant differences on the order of a few centimeters (1 milliarc second, or about 3 centimeters) between observations and the standard theoretical model of precession and nutation. The theoretical model was adopted by the International Astronomical Union in 2000 and by the International Union of Geodesy and Geophysics in 2003. The theoretical model is based on the idea that Earth reacts as a deformable object with a deformable inner core, a fluid outer core, a deformable mantle that is both viscous and elastic (it can flow and stretch), an atmosphere, and oceans. But the theoretical model is not perfect, attendees discussed. In particular, scientists still don’t understand the interactions between the inner core, fluid outer core, and mantle well enough to properly model them. Because the core transfers angular momentum to the mantle, interactions between the two regions play an important role in nutation modeling, meeting participants agreed. The current nutation model incorporates the effect of the flattening of the core due to Earth’s rotation and the fluid pressure and gravitational effects on that flattened boundary, as well as the effects of a simple uniform, dipolar magnetic field. Today, we understand that there are important contributions from other components of the magnetic field and possibly other effects, like the viscosity of the inner core, the viscosity of the outer core, and core stratification. In addition, the core-mantle boundary is not smooth, and pressure forces acting on these topographical features could also play an important role. 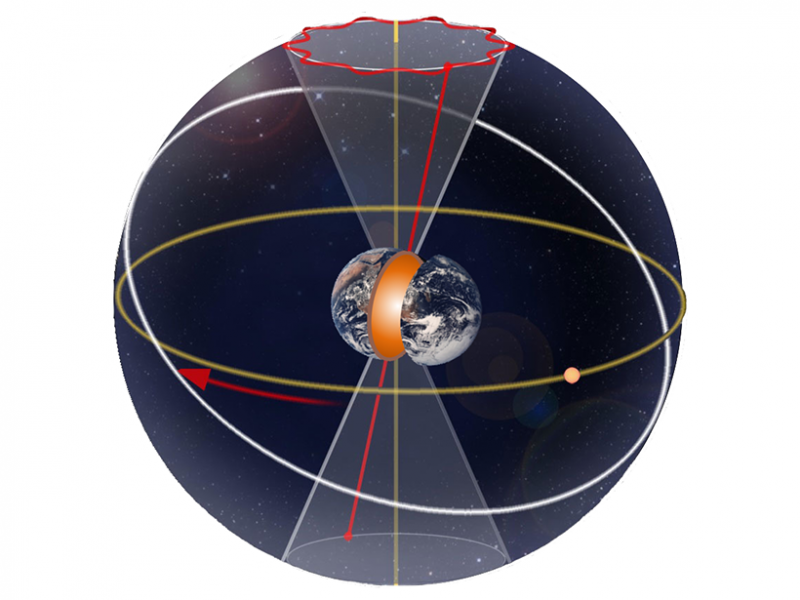 The workshop shed light on all of the mechanisms that might be influencing Earth’s nutation, including the possible interaction between rotational modes and inertial modes inside the liquid core. Future meetings will highlight outcomes and new insights that emerge from the discussions held during this meeting. The work of Veronique Dehant was performed at the Royal Observatory of Belgium under funding from the European Research Council under the European Union’s Horizon 2020 research and innovation program (advanced grant agreement 670874). The work of Richard Gross was performed at the Jet Propulsion Laboratory, California Institute of Technology, under contract with NASA. A University of Wyoming researcher contributed to a paper that has apparently solved an age-old riddle of how constituent continents were arranged in two Precambrian supercontinents — then known as Nuna-Columbia and Rodinia. It’s a finding that may have future economic implications for mining companies. 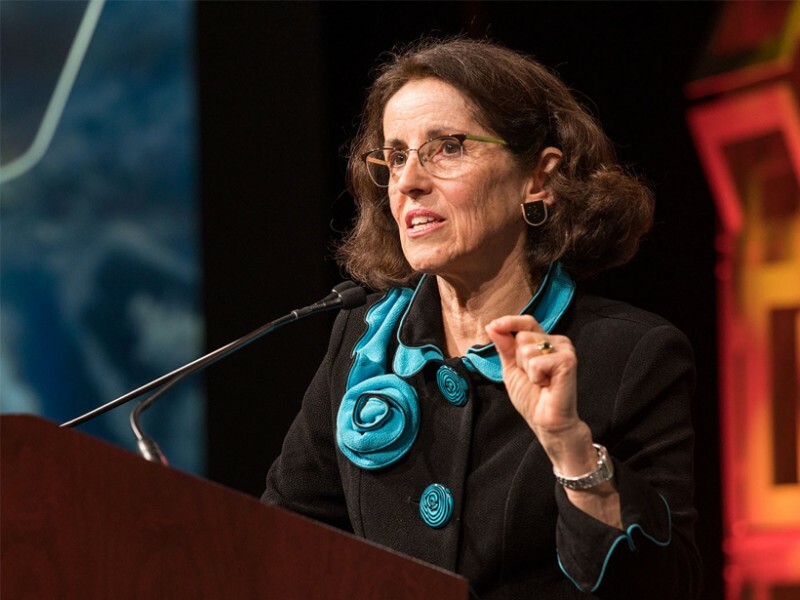 Chamberlain was co-author of the paper, titled “Long-Lived Connection between Southern Siberia and Northern Laurentia in the Proterozoic,” that appeared* in today’s (April 11) online issue of Nature Geoscience. The monthly multi-disciplinary journal focuses on bringing together top-quality research across the entire spectrum of the Earth sciences, along with relevant work in related areas. The journal’s content reflects all the disciplines within the geosciences, encompassing field work, modeling and theoretical studies. 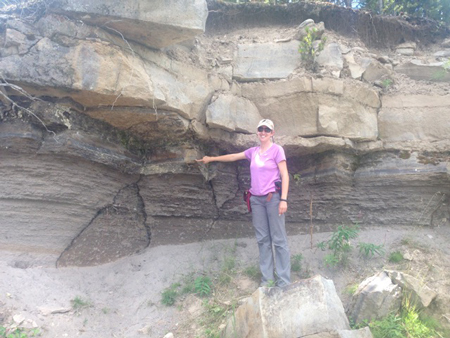 The project determined the ages of nearly 250 mafic dikes worldwide, a number Chamberlain says is large enough to build a database comparison between all of the older continental fragments from roughly 500 million years ago to 2,700 million years ago. The research group also worked on more recent LIPs — about 400 million to 100 million years ago — which have importance for oil and gas exploration, and hydrocarbon maturation models. Chamberlain collaborated on the paper with researchers at Carleton University in Ottawa, Canada; Tomsk State University in Tomsk, Russia; University of Toronto in Toronto, Canada; Lund University in Lund, Sweden; Queens University in Kingston, Canada; Institute of the Earth’s Crust, Siberian Branch of the RAS, in Irkutsk, Russia; Diamond and Precious Metal Geology Institute in Yakutsk, Russia; Institute of Geochemistry in Irkutsk, Russia; Geological Survey of Canada in Ottawa; and the Kosygin Institute of Tectonics and Geophysics in Khabarovsk, Russia. R.E.E. led and coordinated the research and manuscript preparation. M.A.H. and U.S. produced key ID-TIMS U–Pb ages and their interpretation. J.A.H. produced key Ar–Ar ages and their interpretation. K.R.C. assisted in the interpretation of the geochronology results. A.V.O., T.K., A.S.M. and A.N.L. provided key samples for U–Pb dating and assisted in the interpretation of their results. D.P.G. and A.N.D. assisted in the interpretation of the Russian data and its geological context. W.B. provided insight into the LIP correlations and their limitations. K.L.B. provided the background palaeomagnetic context. M.A.H., K.L.B. and A.N.L. were also heavily involved in aspects of preparation, revision and/or finalizing of the overall manuscript. The University of Wyoming consists of seven colleges: agriculture and natural resources, arts and sciences, business, education, engineering and applied sciences, health sciences, and law. The university offers over 190 undergraduate, graduate and certificate programs including Doctor of Pharmacy and Juris Doctor. In addition to on-campus classes in Laramie, the university’s Outreach School offers more than 41 degree, certificate and endorsement programs to distance learners across the state and beyond. These programs are delivered through the use of technology, such as online and video conferencing classes. The Outreach School has nine regional centers across the state, with several on community college campuses, to give Wyoming residents access to a university education without relocating to Laramie. The university is a hub of cultural events in Laramie. It offers a variety of performing arts events, ranging from rock concerts in the Arena Auditorium to classical concerts and performances by the university’s theater and dance department at the Fine Arts Center. Wyoming also boasts a competitive athletic program, one which annually challenges for conference and national championships. 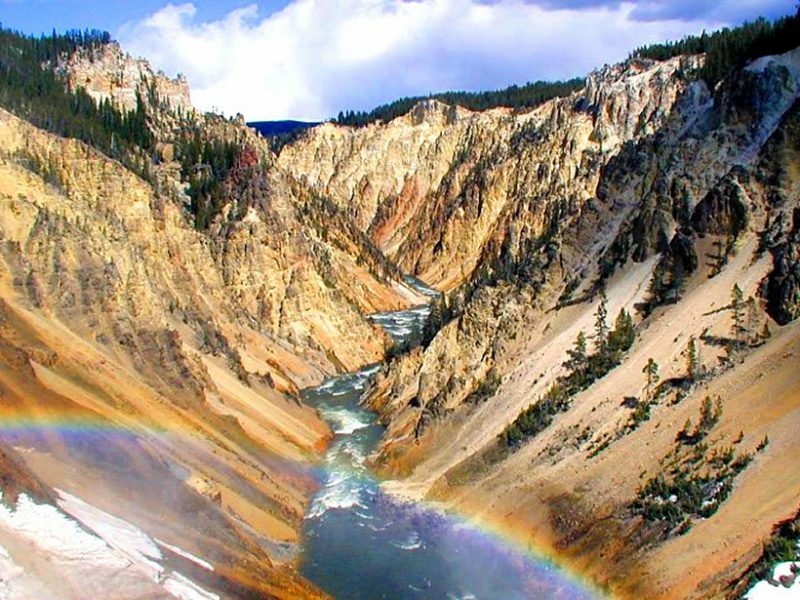 University of Wyoming offers many extracurricular activities, including over 200 student clubs and organizations that include a wide range of social, professional and academic groups. The Wyoming Union is the hub of the campus, with the University Store and numerous student facilities. 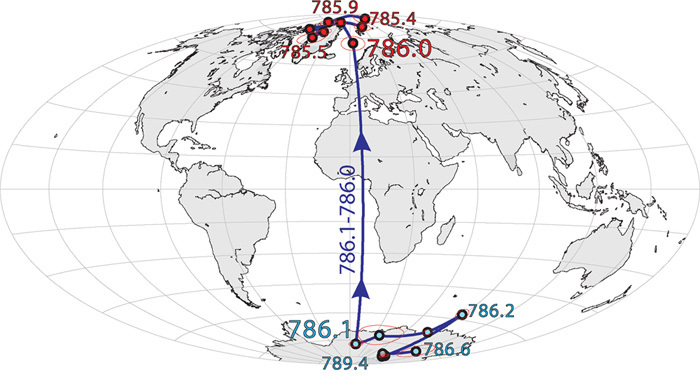 The ‘north pole’ — that is, the direction of magnetic north — was reversed a million years ago. This map shows how, starting about 789,000 years ago, the north pole wandered around Antarctica for several thousand years before flipping 786,000 years ago to the orientation we know today, with the pole somewhere in the Arctic. No image credit. 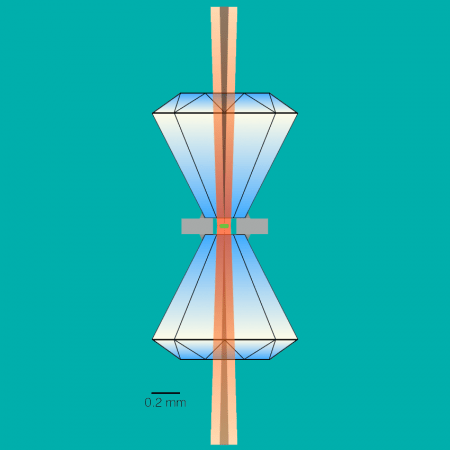 This illustration shows a bridgmanite sample that is being laser-heated between two diamond anvils. This set-up allows researchers to measure a sample at compressions over 1 million times the earth’s atmospheric pressure, while being heated to thousands of degrees Celsius. Deep inside the earth, seismic observations reveal that three distinct structures make up the boundary between the earth’s metallic core and overlying silicate mantle at a depth of about 2,900 kilometers—an area whose composition is key to understanding the evolution and dynamics of our planet. These structures include remnants of subducted plates that originated near the earth’s surface, ultralow-velocity zones believed to be enriched in iron, and large dense provinces of unknown composition and mineralogy. A team led by Caltech’s Jennifer Jackson, professor of mineral physics has new evidence for the origin of these features that occur at the core-mantle boundary. Previously, says Jackson, it was not clear whether bridgmanite, a perovskite structured form of (Mg,Fe)SiO3, could explain seismic observations and geodynamic modeling efforts of these large dense provinces. She and her team show that indeed they do, but these structures need to be propped up by external forces, such as the pinching action provided by cold and dense subducted slabs at the base of the mantle. 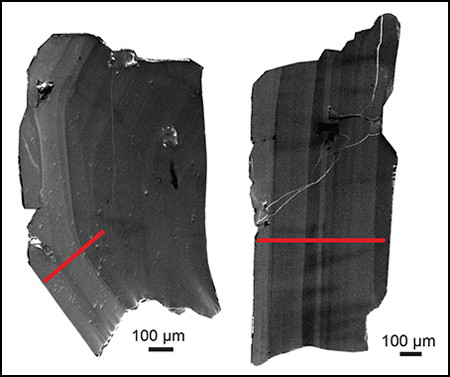 Jackson, along with then Caltech graduate student Aaron Wolf (PhD ’13), now a research scientist at the University of Michigan at Ann Arbor, and researchers from Argonne National Laboratory, came to these conclusions by taking precise X-ray measurements of synthetic bridgmanite samples compressed by diamond anvil cells to over 1 million times the earth’s atmospheric pressure and heated to thousands of degrees Celsius. The measurements were done utilizing two different beamlines at the Advanced Photon Source [APS] of Argonne National Laboratory in Illinois, where the team used powerful X-rays to measure the state of bridgmanite under the physical conditions of the earth’s lower mantle to learn more about its stiffness and density under such conditions. The density controls the buoyancy—whether or not these bridgmanite provinces will lie flat on the core-mantle boundary or rise up. This information allowed the researchers to compare the results to seismic observations of the core-mantle boundary region. 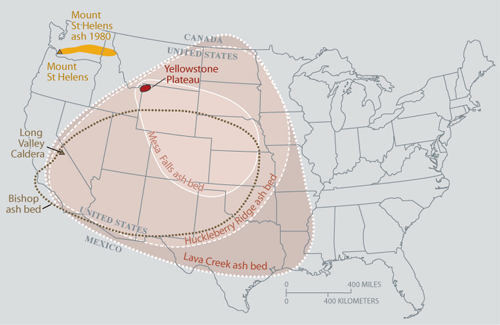 “With these new measurements of bridgmanite at deep-mantle conditions, we show that these provinces are very likely to be dense and iron-rich, helping them to remain stable over geologic time,” says Wolf. 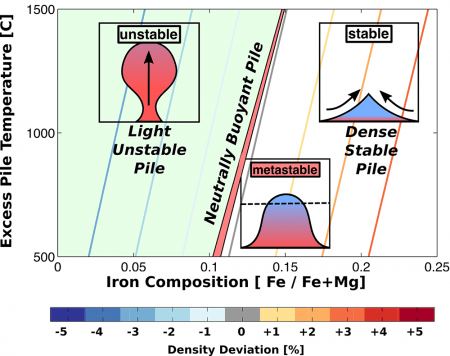 Using a technique known as synchrotron Mössbauer spectroscopy, the team also measured the behavior of iron in the crystal structure of bridgmanite, and found that iron-bearing bridgmanite remained stable at extreme temperatures (more than 2,000 degrees Celsius) and pressure (up to 130 gigapascals). There had been some reports that iron-bearing bridgmanite breaks down under extreme conditions, but the team found no evidence for any breakdown or reactions. The results of the study were published in a paper titled The thermal equation of state of (Mg,Fe)SiO3bridgmanite (perovskite) and implications for lower mantle structures. In addition to Jackson and Wolf, other authors on the study are Przemeslaw Dera and Vitali B. Prakapenka from the Center for Advanced Radiation Sources at Argonne National Laboratory. 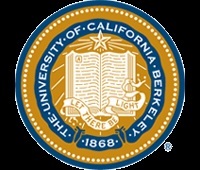 Support for this research was provided by the National Science Foundation, the Turner Postdoctoral Fellowship at the University of Michigan, and the California Institute of Technology. The article Climate driven vertical acceleration of Icelandic crust measured by CGPS geodesy by Compton, Bennett and their co-author Sigrun Hreinsdóttir of GNS Science in Avalon, New Zealand, was accepted for publication Jan. 14, 2015, and is soon to be published online. The National Science Foundation and the Icelandic Center for Research funded the research. “I was surprised how well everything lined up,” she said.